Simmtronics Simmbook light weight and compact netbook comes with a 1.6GHz Intel Atom N270 CPU, 1GB of DDR2 RAM (up to 2GB), an Intel 945GSE chipset, an Intel Generation 3.5 integrated graphics, and a 160GB hard drive (up to 500GB). Simmtronics Simmbook netbook has features a 10.2-inch LCD display with resolution of 1024×600 pixel, 802.11b/g Wi-Fi, 1.3MP webcam, 10/100 LAN, SD card reader slot, and a 2200mAh 3-cell battery (upgradeable to 4400mAh 6-cell battery pack). The Simmtronics Simmbook netbook is equipped with a VGA output, built-in 2 speaker, internal microphone, and three USB ports. 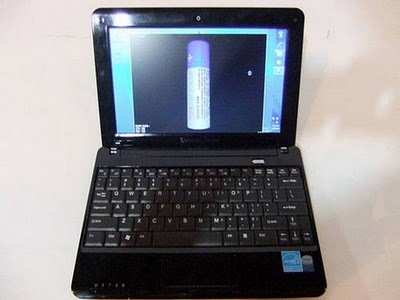 Simmbook netbook has supports Windows XP, Windows 7, or Ubuntu Linux OS. It has weighs 1.2 kg (with 3-cell battery). Simmtronics Simmbook netbook also comes in black, blue, and red color chassis with piano finish. Simmtronics Simmbook netbook is available in India with price of 13,999 Rupees (about US$306), while an Acer Aspire One 532h with an Intel Atom N450 processor has price $299 in US market. This entry was posted on July 15, 2010 at 8:05 am	and is filed under Notebook Technology. Tagged: Gadget Technology, Notebook Technology. You can follow any responses to this entry through the RSS 2.0 feed. You can leave a response, or trackback from your own site.